Ayrton Senna, the greatest Formula One driver who ever lived, immortalised in a series of spectacular statues by one of the greatest artists working today. 160kg of raw bronze and eight months of relentless toil at the very edge of what is technically possible have gone into the creation of this sensational homage to the great man, who left us 25 years ago this May. Set in the pose of screaming flat out through one of F1's most hair-raising corners, Oz has captured the daring philosophy of Senna as he himself described it: "If you take away Eau Rouge, you take away the reason why I do this." Left - right - uphill, accelerating hard, back end trying to kick out; Oz has taken static metal and brought it alive. He says: "It's a position alien to most, and even many F1 fans don't appreciate how extreme it is, even back in the 90s, although more so now. If there's one thing I am happiest about with this statue it is the dynamic and balance of the position". Cast in three sizes, from full-size to table-top, this fabulous sculpture will be joining us in April for the opening of the Fresh Art Fair and we can't wait! If you managed to make it to the private view for our Peter Blake show, you might have been a little surprised and entirely delighted to meet the man himself who joined us for the launch of the show. It was truly an honour to host Sir Peter for the evening, alongside some of the highlights of the last 10 years of his printmaking career. Not only was Sir Peter present, but we were also joined by the dazzling CCA Art Bus, showing Blake’s Replay Series and attracting much attention. Peter’s work remains on display in the gallery and a more extensive collection of work can be viewed on his page on our website which is available to order. Q. What is your creative process? What inspires you? A.Travelling and Expeditions to Pakistan, Montana (USA) Svalbard (Arctic Norway) Lesotho (South Africa) and Iceland. I have always tried to make art on the move - drawing and painting and I take hundreds of photographs. Whilst at University in London I was looking at the work of Robert Rauschenberg and lots of other painter/printmakers such as Jim Dine, Jasper Johns and Richard Hamilton and I was beginning to experiment with printmaking. I found that by working with screen-printing I could combine all these media. I was also looking at a lot of contemporary illustrators and graphic designers such as Dave McKean, Vaughan Oliver and David Carson. At the graduation show I was taken on and represented by Debut Art (at the Coningsby Gallery) in London and I worked as an illustrator for a while. On moving to Bristol I developed a screen-printing studio and exhibited in bars, restaurants, hotels and galleries. At about this time I moved away from illustration to focus on my own creative ideas, original paintings and print editions. It was an exciting time as the Street art movement was really beginning to blow up…In summary I can find inspiration in any subject matter. American and British pop art, old movie posters and vintage comics - later on I became interested in mythology and history. Portraiture has appeared at times and recently I have been looking at landscape and natural history themes. Q. You don’t seem to be limited to what techniques and materials you use; please tell us about that. What made you go into screen-printing? I love drawing (but don't practise enough) I create collaged scrapbooks and take hundreds of photographs…I have had my work animated once which was very interesting. I can screen print onto anything that is flat. So that obviously includes paper, canvas, material such as silk and denim - plastic, wood and even surf boards! I love texture and bright colour. With a screen printed image you can lay down very subtle muted colour (almost like water colour) or big fat slabs of bright - pure acrylic...you can work in layers too. A screen print can be very striped back and elegant or multi layered. A print that I produced for Formula one management back in 2003 had 40 separate layers of ink. Q. Do you have a favourite subject matter? More recently I have gone back to painting birds and wildlife. Q. “A Passion for Print” is a retrospective exhibition showing your work from your 20 years as an artist. How do you feel your work have evolved over that time? My palette became softer and more subtle and the screen-printed elements of my work became more experimental and less reliant on 'found' imagery. Working directly with close friends as models I embarked on a series of portraits, which were exhibited in 2012. These newer paintings have a looser and more luxurious application of paint relying on drips and splatters and 'happy accidents'. The final image is a composite of abstract painting and stretched and distorted photography. Each layer of paint and / or print and mark making will go through a process of destruction, addition and editing until a final outcome is achieved (often by chance). More recently I have gone back to traditional drawing and painting - having the work photographed then printing from the resulting images. Q. You were recently invited to exhibit with the famous Bvlgari Curiosity Shop in Rome in their “Serpentina Art Exhibition” which is tremendously exciting. How was that for you? A.It was a wonderful and unforgettable experience. Bvlgari flew me out to Rome and put me up in a lovely hotel for the private view and launch of their Serpent themed museum / show room. I was met at the Airport and then taken straight into the centre of Rome. Later in the evening I went up to the Bvlgari archives and had a private view of their jewellery and design archive. Q. What is next for you? A.Continuing to build my audience in the West Country…. Q. Tell us a bit about your painting technique…when you start a painting, do you visualise how it will look when it’s finished or do you let the painting develop? A. I have no clear vision at the start as I purely let myself be guided by the materials and my paintbrush. I work with a succession of layers: plaster, ink, Japanese acrylic paper etc. After mixing all these materials, the architecture of the painting makes sense. Q. What is your favourite subject to paint? A. Photography and my painted creations are both equally important as I also practice photography and image manipulations. It is the characters that inspire me as well as the meaning of painting through its décor and history. Q. How long do you typically work on a painting? How do you know when it’s finished? A. I work on several paintings at once as the preparation work takes the longest. Once the preparation is finished, I use materials and techniques that dry quickly because I feel urgency in expressing myself so I need to work fast. Materials that require long drying time are not for me! Knowing when a painting is finished is quite a miracle. It is entirely irrational in my case because I would not be able to explain why. Q. Do you have a favourite artist? Who or what inspires you? A. My work is often compared to Gustav Klimt and even though I am much less decorative in my paintings, I am very flattered by the comparison. I admire Chagall, Soulage and Flemish paintings and I am often inspired by poetic literature and music. Q. There is sometimes a rope or string the figure in your painting is holding, what does this signify? A. The ropes and strings symbolises different ways of connection: connecting to yourself, to others, to nature and the universe. My women are anchored but at the same time aerial as they sail between the earth and the sky. Q. Talking firstly about your painting technique, when you start a painting, do you visualise how it will look when it’s finished or do you let the painting develop? A. I usually do small pen sketches, it helps to build composition and form. However, the expression on the big canvas could take me in a completely different direction. I think my best paintings are when I cannot explain myself how I created them. Q. Do you begin with a sketch or dive straight in with oils? A. Depends on my mood today. I love doing small sketches and sometimes they could turn into cute art pieces. Sometimes I start work on the large canvas and after a few hours I already know that it isn't going to be good! So I am just turning my large canvas upside-down and starting a completely new painting! I also love the first brushstrokes on the pure white canvas surface - I never know what to expect from it and it gives me the adrenalin buzz! A. I love working with people. But most of all I love challenges. I love to take myself outside my 'comfort zone', start something that is very unusual for me. This is why I did a series of paintings of dogs and chickens. Q. How long do you typically work on a painting? Do you come back to it again and again and how do you know when it’s finished? A. I could start the work at 9 am and finish it at 1pm. I call these works 'perfect'! I love when the canvas can 'breathe'. The more I work on a canvas, the less I can expect a good result. This is why every month I’m throwing away between ten and twenty canvases, which will never become an artwork. Q. Do you have a favourite artist? A. Schiele, Degas, Picasso, Chagall - these are my Masters. But I love most of the impressionists and crazy I’m about expressionism and abstraction. Q. You’ve been exhibiting your paintings with the Paragon Gallery now for 5 years, how do you feel your work has evolved over that time? A. The Paragon Gallery is the heaven for artists and art lovers. They are experimenters with an excellent taste in art. They are always welcoming my new painting ideas. To be an artist it is very important for me not to feel boundaries and stay creative. I think the gallery made me feel more confident and professional as an artist. Q. You’ve achieved many accolades over recent years, including repeated selection by the Royal Institute of Oil Painters for their Annual Exhibition, what’s next for you? A. My plans are work, work and work. I have many unrealised ideas about future collections and projects. I will again apply to ROI, Summer Exhibition and many other competitions this year. However, my main achievement is my collectors. People who appreciate my art so much, that opens their homes for my paintings. This is so inspiring! We are proud to announce the arrival of a new artist for the Paragon. Alice Cescatti's captivating originals are light themselves. Her unique technique involves a rarely seen water-gilding process, building up many layers of sanded gesso and clay on wooden panels. She then floats individual silver or gold leaf onto the clay surface using a specialist method dating back to Egyptian tomb paintings and reliefs from the 23rd century BC. The gold or silver leaf surface is then hand burnished with an agate stone to enhance the quality of the metal as a light source. We're nearly at the end of the Cotswold Hare Trail and what a delight it has been! We've had a huge number of people viewing our beautiful Bluebell on the hunt for hares and very soon she'll be off for a polish in readiness to be auctioned off for National Star College. The gala auction will be taking place at The Centaur, Cheltenham Racecourse on Friday October 6th from 6pm - 11pm. Tickets to attend are £90 per head and you will be wined and dined and have the opportunity to bid on your favourite hare. Let us know if you would like more information. We'd like to say a special thank you to our star artist Georgie Woolridge for doing such a brilliant job painting her, Bluebell is truly stunning and it just proves, no project is too big for this hugely talented up and coming artist. We know our artists love a challenge and what better challenge than designing and painting a giant hare! 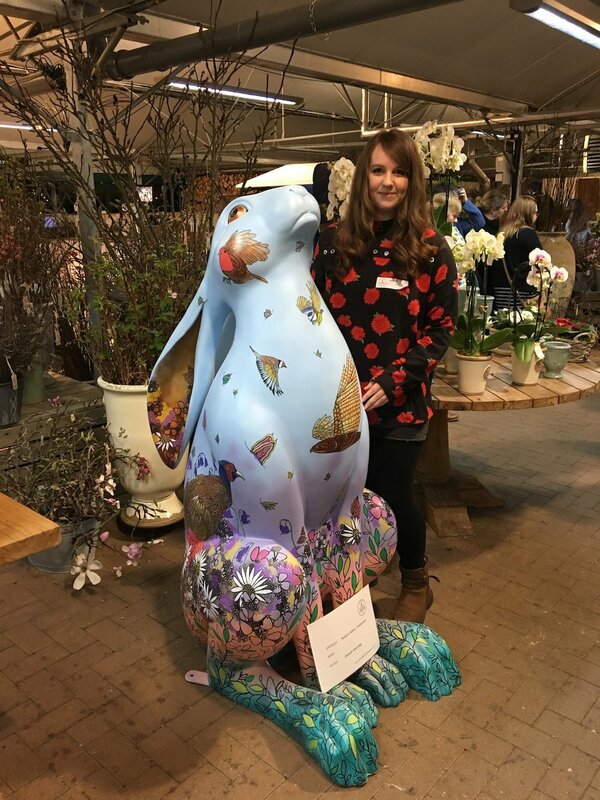 Star local artist Georgie Woolridge has been nominated by us to paint a 5ft by 2ft hare sculpture which will be part of the 2017 Cotswold Hare Trail. The hare will be on display either in the gallery or outside on the pavement from March 25th. You can keep up with Georgie's progress on our facebook page. The image below was progress as of early February, we think he/she is going to be a beauty! We hope you can come and visit him/her from the end of March onwards and perhaps follow the trail round the Cotswolds to find all of the other hares. This year's nominated charity is National Star. The hares will be auctioned in October with proceeds going to the college and helping them continue the amazing work they do. Hugely talented Spanish painter, Raquel Alvarez has another accolade to her name. This Summer, The Society of Women Artists awarded her with the President's and Vice President's Choice Award for the best work of art in the Society's Annual Exhibition. Congratulations Raquel! Originally from Barcelona, Raquel is based in Stroud and joined the Paragon Gallery as a guest artist for our Cotswold Artists exhibition in April 2016. We immediately asked her to become a permanent artist with us, following the success of the show and the obvious quality of her work. We will be taking Raquel's work to the Affordable Art Fair in Battersea, London, in October this year. Gillie & Marc's Paparazzi Dog Sculptures have gone from being an art experiment about photographing celebrities to sough-after celebrities in their own right. After appearing in Melbourne, Sydney, Singapore, Beijing and Shanghai, the four Dogmen will be sniffing out the rich and famous in Brooklyn's buzzing art district, Dumbo, in the wonderful New York City. Gillie & Marc named the dogs Charles, William, Harry & Tom after the Royal Family. The artists wanted us to reflect on the tragic death of Princess Diana, intentionally using a group of dogs to expose the pack mentality of the media and how we hunt down celebrities to get that dangerous behind the scenes glimpse into their private lives. Gillie & Marc have worked side by side for 25 years, painting, sculpting and photographing with the goal to create joyful and thought provoking work that celebrates unlikely unions while inspiring us to re-examine the status quo. Their work is held in private and public collections all over the world. A selection of their (some what smaller) sculptures can be seen and purchased from the gallery here. We can also order from their website, Dogman and Rabbitgirl love to fly! Our star artist Georgie Woolridge talking about her work, inspiration and the artistic journey she has travelled. For more information about Georgie, visit her page on our website. We are very excited to introduce a new artist to the gallery! Patrick Cornee is a French painter who lives and works in Mougins, France. 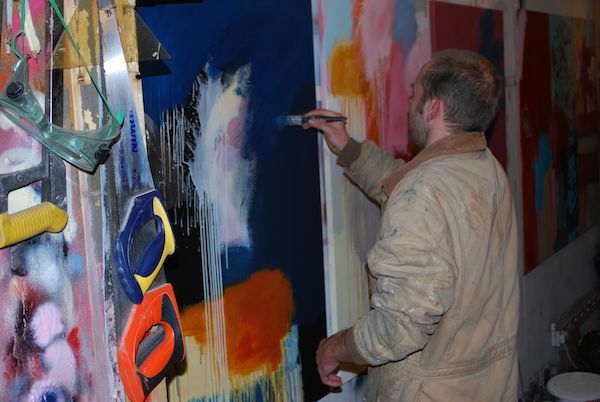 He works with oils on canvas, to symbolise femininity, longing and love, inspired by Pop-Art and his own childhood. We would like to congratulate one of our shining artists, Christa Hillekamp, for her feature in the February/March 2016 edition of International Artist Magazine. In the 10-page spread, she discusses her work, what inspires her and the process that goes into creating her majestic landscapes. Christa (a German-born artist living in Spain) is one of our most popular resident artists within the gallery, as well as achieving great success at various art fairs. We are currently the only UK gallery that exhibits her work. We are very proud to announce that one of our most talented painters, Iryna Yermolova, has yet again been selected to exhibit at this years Royal Institute of Oil Painters Annual Exhibition at the Mall Galleries in London. This is the third year in a row Iryna has been accepted and I think we can all agree it is well deserved. Iryna is one of our resident artists here in Cheltenham, we hang her work all year round and she's featured in our annual exhibition of Russian artists, The Russian Evolution, which will take place in February 2016. The ROI was founded in 1882 and is dedicated to celebrating, informing and assisting artists who practice the art of oil painting, and through its awards, they actively encourage and support talented young painters. Our star local artist, Georgie Woolridge, has had a beautiful adult colouring book published by Modern Books. The book "Birds" has been released from the publisher and is available to purchase from the gallery, Amazon, Waterstones and other book retailers around the country. Georgie's book is on display here and in stock at the moment, although we have limited copies. The first edition has already sold out and is due to be reprinted in November. Adult colouring books are heralded as the new stress-buster for all ages, it's the perfect gift for Christmas! We are delighted to introduce husband and Wife, Gilles Bourlet and Lys Flowerday, and welcome them to our creative team. Gilles, originally from Saint Just-en-Chaussee in France, designs and creates imaginative luminous sculpture, each with their own character and story. Lys, from Lincolnshire, is a painter with a difference. Using unique techniques, hand drawn images are subtly blended and woven with discarded paper on antique book covers, creating fairy-tale like scenes. Works by both artists are on our website and on display in the gallery. We are incredibly lucky to introduce a new artist to the gallery! Corinne KO's whimsical works are beautiful demonstrations of mixed media on canvas, comprised of painting and photographs. Corinnes works are now up on the walls, so please come and have a look! We are delighted to launch works by yet another hugely talented local artist. We will be hanging the first collection of original works by Karen Mortimore this month. Karen's current series of work focuses on Still Life and is quintessentially English and quirky all at the same time. We hope you love them as much as we do! We are very excited to introduce brand new sculpting duo, Gille and Marc, all the way from Australia. As husband and wife, Gillie and Marc are contemporary artists who collaborate to create art as one, applying the iconic imagery of the dog/human hybrid to celebrate the powerful relationship the exists between man and animal.